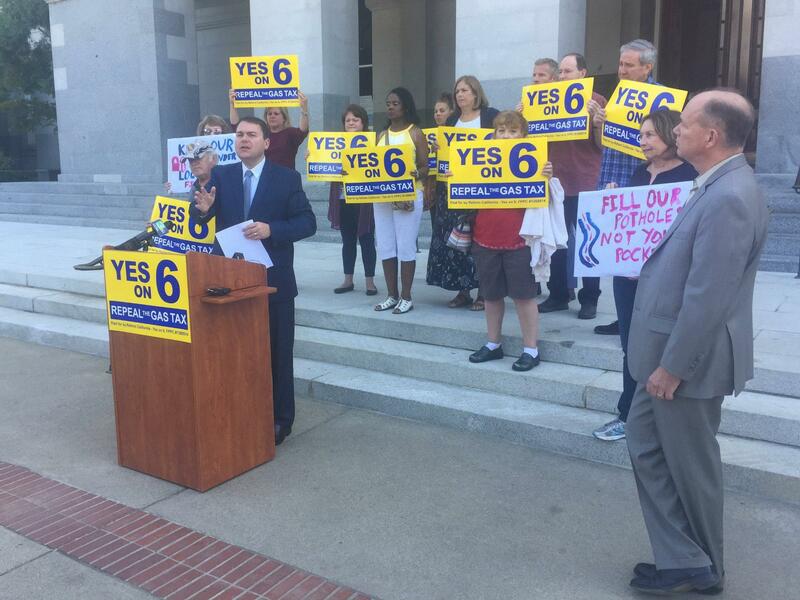 Carl DeMaio, Yes on 6 Proposition chairman, speaks in Sacramento. Backers of Proposition 6, aimed at repealing California’s gas tax increases, unveiled a new 2020 ballot initiative on Tuesday just ahead of the November election. The initiative would establish two so-called “citizen lockboxes,” one allocating gas tax revenues to road repairs and the other dedicating sales tax revenue from cars to support public transportation. It was spearheaded by Yes on Proposition 6 chairman Carl DeMaio. He says using existing revenues to fix roads would eliminate the need for lawmakers to raise gas taxes. Michael Quigley is executive director of the California Alliance for Jobs. He leads an alliance of contractors and construction unions that oppose Prop. 6 and calls DeMaio’s plan a bad idea that takes money from other programs and services. The proposition would also eliminate California’s heavily contested high-speed-rail project.